Create or Find the Work You Love! Do you dread Mondays? Are you at work watching the clock and can’t wait until Friday, yet it’s only day 3 of the hostage situation? Than this conversation is for you. Today, Dan Miller is going to share with you how to find or create the work you love in just 48 days. 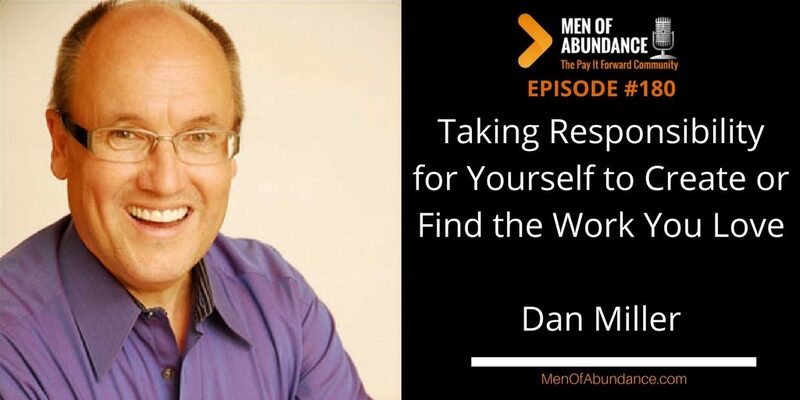 Dan is the author of the New York Times best-selling 48 Days To The Work You Love, No More Dreaded Mondays and Wisdom meets Passion. He has been a guest on CBS’ ‘The Early Show,’ MSNBC’s ‘Hardball with Chris Mathews, and the Dave Ramsey Show. Dan has spoken at the White House Christian Fellowship, and is in high demand as an expert on new opportunities in today’s changing workplace. His 48 Days Podcast consistently ranks in the top 3 under Careers on iTunes, and the 48DaysEagle.com community is viewed as an example around the world for those seeking to find – or create – work they love. Dan has been married to Joanne for over 50 years. They have three grown children and seventeen grandchildren and live on 9 beautiful acres in rural Franklin Tennessee. Men, we simply scratched the surface of what you will learn by connecting with Dan Miller at the links above. I’m in several masterminds and in the process of building one just for Men of Abundance. I’m also launching, in the next two weeks, a members site specifically for small business owners and entrepreneurs. If you feel you could benefit from coaching with 1 on 1, in a small group and or in the entrepreneurs members site, I invite you to request a 30 Minute Discover Call with me.